There will be something for everyone and for all ages. Don't miss it! The 950th Anniversary of the Battle of Hastings. We bring you a festival of Hastings TODAY. Trains run daily weather permitting. 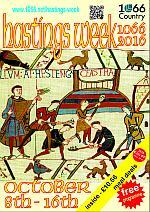 During Hastings Week, £1 off fare on production of current Hastings Week printed programme. Basement Gallery, Borough Wines 34 Robertson Street, Hastings TN34 1HT. 7th - 16th October, preview 6th October. For all to enter, child and adult alike. It is really simple to enter and all you need to do is write a poem based on Hastings Old Town, these can be your memories or experiences, and send it to Cllr. James Bacon, Aquila House, Breeds Place, Hastings, TN34 3UY or by email to cllr.james.bacon@hastings.gov.uk. Please include your full name and contact details with your poem entry. The deadline for entering this exciting competition is Hastings Day, Friday 14th October. The winner will not only have their poem displayed in the Parish news and local press, but also receive a certificate and prize for their efforts. Cllr bacon looks forward to reading your poems with the hope of eventually compiling a 21st Century Book of Hastings Old Town poetry for all to enjoy. Theme "Guys dressed as Normans or Saxons"
Window display must remain for the whole of Hastings Week (8 - 16 October 2016). Location meet at the top of the West Hill Lift A tour of Hastings Old Town, the premier ancient Cinque Port with its wealth of historic buildings, twittens and cat-creeps. Hear about the celebrities that flocked to Hastings. Volunteer guides lead all walks downhill into the Old Town. Free but donation to OHPS welcome. Limited disabled access because there are steps en route. 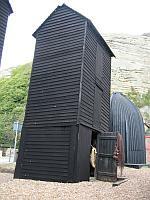 Meet at the Hastings Fishermen’s Museum, Rock-a-Nore Road, Hastings, TN34 3DW You will explore the Stade Fishing Quarter with our volunteer guides discovering the history of our sustainable fishing community and learn why the Stade is known as a ‘living museum’. Free but donations welcomed to Hastings Fishermen’s Museum. Disabled access. Visit www.ohps.org.uk for more information. Informative descriptions of a wide variety of local hauntings with thought provoking explanations. Dare you join us for this glimpse into the strange and sometimes frightening spirit world? Duration approx 1 hour 20 mins. Dogs on short leads permitted. In depth exploration of hastings most historically and visually interesting main thoroughfares, All Saints Street and High Street. Meet: Winkle Island, Rock-a-Nore Road. Admission Adult £7.00, payable on the day, no advance booking Duration apx 1 hour 40 mins. Dogs on short leads permitted. Tracing the development of St.Leonards-on-Sea from its inception as a Regency planned new town to the eve of its Victorian expansion. 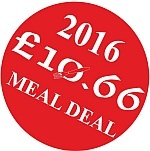 Admission Adult £7.00, payable on the day, no advance booking Duration apx 1 hour 30 mins. Dogs on short leads permitted. A trail of discovery through concealed byways, most little known' and rarely explored featuring obscured and obscure seaside life. Meet: St.Leonards Warrior Square Railway Station main entrance Admission Adult £7.00, payable on the day, no advance booking Duration apx 1 hour 10 mins. Dogs on short leads permitted. The actual location of the famous battlefield has now been challenged. We visit the alternative site vividly describing the context and course of the conflict. Admission Adult £7.00, payable on the day, no advance booking Duration apx 1 hour 20 mins. Dogs on short leads permitted. Grim and gruesome local history featuring true tales of terror from Old Town's less illustrious past. Definitely not for the squeamish! On Sunday 16th October only. Tickets in advance £4.50 adults, children £3.50 under 14, From guide on the walk at £5.00 Adults, £3.50 children under 14. Includes donation to OHPS & Hastings Week. Mayor’s party including Town Crier & band to meet at the stade car show . Parade to move off and march to the Castle. 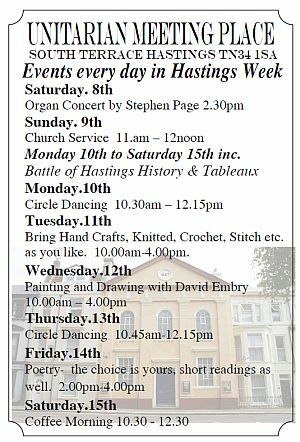 Mayor to announce opening of Hastings Week celebrations. Chairman of Hastings Week Committee to give speech and Flag is raised. This year for one day only and entries by invitation only. Free sdmission but donation to Hastings Week welcome. Meet at the Hastings Fishermen’s Museum, You will explore the Stade Fishing Quarter with our volunteer guides discovering the history of our sustainable fishing community and learn why the Stade is known as a ‘living museum’. Free but donations welcomed to Hastings Fishermen’s Museum. Disabled access. At Hastings Unitarian Meeting Place, South Terrace. David Clarke will talk on. How the events of 1066 might have been reported if today’s press had existed then. Tickets £3 from Hastings History House. Refreshments available. 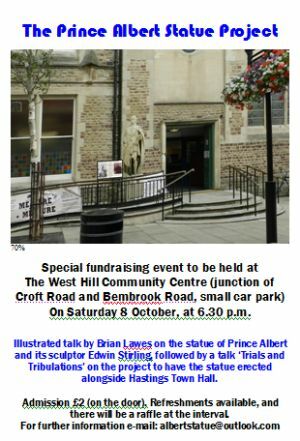 West Hill Community Centre (junction of Croft Road and Bembrook Road, small car park) Special fundraising event - Illustrated talk by Brian Lawes on the statue of Prince Albert and its sculptor Edwin Stirling, followed by a talk ‘Trials and Tribulations’ on the project to have the statue erected alongside Hastings Town Hall. Admission £2 (on the door). Refreshments available, raffle at the interval. The Sprat & Winkle Run from Sevenoaks attracts around 70 different commercials including buses and coaches, and now is a permanent fixture on the preservation scene, so please come along to the Stade to have a good look at the vehicles and feel free to chat to the owners and drivers who have come down to Hastings, we look forward to meeting you. The Hastings net shops have recently been upgraded to grade II* listed buildings because of their architectural uniqueness. Since the 1980s, local historian Steve Peak has played a leading role in saving them, and he owns one, dating from 1835, which he preserves as a museum. Inside is a large collection of original fishing and marine artefacts, many dating from pre-World War Two. The museum is not open very often, but today you can come inside and catch a glimpse of life in the days of sail (but not if it is raining!). Maureen Charlesworth Chess Challenge White Rock Hotel. This event is aimed at casual players (those without an official chess grade or with a low grade). 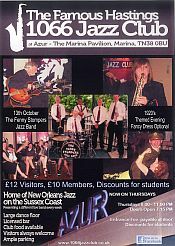 This will be the eighth year that this Hastings Week event has been held and has proved to be very popular. There will be trophies and cash prizes separately for juniors (below the age of 14) and seniors. Each participant will play five games against different opponents. Entry fee (payable on the night): £3 (£2 for juniors under 14). Emmaus provides a home and work for formerly homeless people in a supportive, family environment. Residents live on site and work together in our charity superstore, and our shop in Battle High Street selling quality Bric a Brac and furniture.collecting and renovating donated goods to sell in order to support themselves. Come along to our open day and take a look around! Browse our superstore and meet residents, trustees & staff over a tea or coffee to learn more about our operation and our future plans. Taplin Centre, .RESULTS AWARD CEREMONY - Memories Competition. This year the theme is 'Memories of Past Times' and this is open to Visually Impaired and Norman Vision. 150 to 1000 words, return your entries to HRVAB, 3 Upper Maze Hill, St Leonards TN238 0LQ by Monday 12th September 2016. Free but a donation to Hastings Week funds would be appreciated. contact André Palfrey-Martin MA BA Hons PGCE Tel 01424 445858 : Mob 07922064218 andpm@btinternet.com. Friday 14th October – Hastings Day! 1pm – More than 600 local schoolchildren will gather at Battle Abbey before parading up Battle High Street led by King Harold and King William. 3pm – A multi-denominational commemorative service will be held in St Mary’s parish church in Battle. Bishop Martin of Chichester will attend, and re-enactors will be taking part. 4pm – Watch a selection of displays on the ‘Abbey Green’ in front of Battle Abbey Gatehouse. 5.30pm – A military band will march up and down Battle High Street, before performing a sunset ceremony and lowering the flags. 8-11pm – From Paris for one night only, join France’s top mediaeval band Les Derniers Trouvères for an evening of music, song and dance. Poetry- the choice is yours, short readings as well. who took part in the epic conflict. 10am – Enjoy the spectacle of the 64th National Town Criers’ Championship, resplendent in their ceremonial regalia, shouting for the honour of being England’s best. 11.30am to 2.30pm – Norman and Saxon guy-making workshops, and storytelling. Guys will be judged at 3pm on the Stade Open Space. Midday to 5pm – Music, Norman longboats, archery displays, skirmishes, hog roast, mead, cider and more. Midday to 3pm – Drumming performances around the Old Town, culminating in a Norman/Saxon drum off outside the Albion (south side). 3.30pm – Colourful daytime fireworks display, in the style of the magnificent Spanish Mascleta. 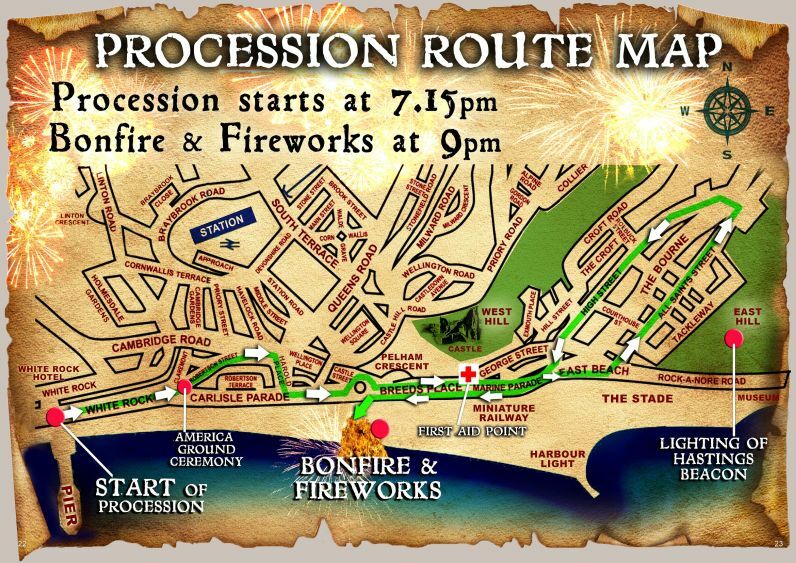 Get your Norman and Saxon outfits on for a gigantic procession around the town, starting from the Stade Open Space. Hastings will be lit by hundreds of burning torches held aloft by the many Sussex bonfire societies. The procession will start from the White Rock. Hastings Welsh Society - Join us for tea or coffee and Wesh cakes. You don't have to be Welsh to attend - everyone welcome Flat 1, Kent Lodge, 2 St Matthews Road, St.Leonards on sea TN38 0TN. Entry £1. regret no disables access. Safety Notice: Please respect the safety barriers and do not pick up discarded torches or bring your own fireworks and comply with any requests from the marshals. Keep your children with you at all times and ear protection is recommended if you or your children are frightened of loud bangs. Please do not bring pets and dispose of all litter correctly Please give generously as all money collected goes to charity. 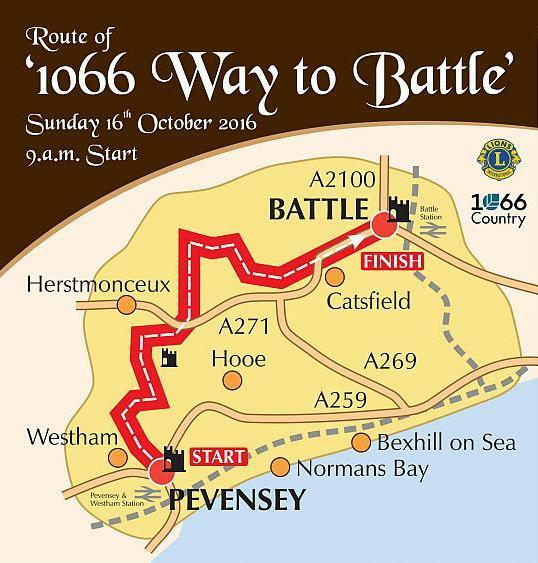 This 17-mile foot race will follow the 1066 Country Walk from Pevensey (where William landed) to Battle (the site of his famous victory). Limited to 1,066 entries. 9am start at Pevensey Castle, fi nishing at Battle Abbey from 11am. A re-enactment of the Battle of Hastings will take place on the historic battlefield. Hundreds of re-enactors from all over the world will represent the Normans, Saxons and other armies who took part in the epic conflict. At the end of an extraordinary week, we come together to reflect in music, song and closing speeches, and to unveil the People’s Tapestry. Featuring Herbie Flowers and Mike Hatchard. Starting at Pevensey Castle,going through Castle grounds and out the West gate into Church Lane then into High Street.for approx 300 yards. Turn right into Peelings Lane,and continue on country lanes through Hankham Hall Road and Hankham High St(over Bridge over A.27) to Rickney Lane junction. sharp right turn on footpath towards Herstmonceux Castle. Aim for Church Spire. turn right into HMC Grounds. Follow past HMC Castle on left. turn right onto Road for 300 yards,then cross road to entrance to 1066 Path again. Follow path, goes round a field and comes out of gate into narrow lane. Turn right in lane and continue up lane(ignore the path to 1066 way over style (dangerous route). Allthough The Bulls Head Pub is on left corner. Keeping to right hand side path for 400 yards,then cross road to Style marked 1066 Way. Continue to follow Path/Fields to Wilsons Farm. Turn right into lane(which is still the 1066 pathway),after a mile turn to left Brown Bread Street and you come to The Ash Tree Pub. Continue past for 600 yards and turn right over Style marked 1066 way. Short distance come to Road, continue over to road opposite(still on 1066 pathway) Penhurst Lane.Approx a mile to Ashburnham Forge,and take style on right marked 1066 Way.Slighty hidden, so look for it near a large gate on right. Follow cross country to Stevens Crouch.A.271,and cross over Road to Track opposite,still 1066 way. 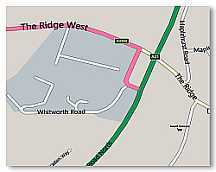 Follow path to Catsfield and B.2204,and turn sharp left,which leads to The White Hart Pub. Follow on path at side of road until turn left on Footpath(just past Playing Fields), and only a short distance till style and exit from field to Road B.2204 again. Cross over Road to other side a few yards to left into Track Entrance(Starcroft Farm). and follow 1066 pathway signs again. The remaining nearly two miles are cross country towards Battle. The route comes out by the side of Battle Abbey, the finish would be in the small road by side of Abbey Green and shops. More information HERE To Enter go to:- //www.sportsystems.co.uk/ss/event/1066WaytoBattle. Distance approx. 17miles.Ascent 1274 ft. Decent 1037 ft.
Main Road approx half mile..